Exams are drawing closer and that is both a relief – at this point I really just want to be done with this taking exams business – and a consternation – they do seem to spring up on one every year rather unpleasantly and seemingly out of the blue. To deal with my mix of boredom and quiet anxiety it has been useful to seek out various different places to do revision. 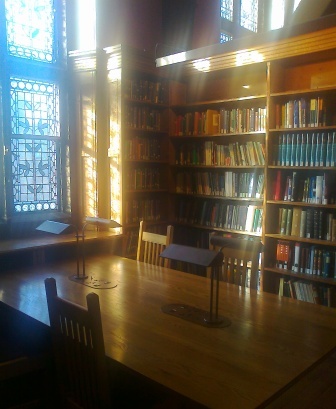 A friend of mine even has a blog dedicated to describing several Cambridge libraries. Just across the street is the Colman Library, the library of the Department of Biochemistry. Again this is quite an old building with large wooden desks or smaller, personal booths to sit at. It is rarely busy, often giving it a feeling of calm, but the people who do study there are often my (stressed?) colleagues, which could become a bit unpleasant the closer we get to exams. If one is feeling particularly brave as a science student one can make one’s way to the Sidgwick site where several art/humanities and social science departments are situated. The main recollection I have of the law library is its coldness (temperature-wise). In the economics library people were generally better dressed, although I hear that this is also deteriorating as exams approach. The Judge business school has an “information service” instead of a formal library, in which people can chat and bring in drinks, which makes for a more relaxed atmosphere, but when I heard some students (?) talking about their newest great idea in which they’ll move from the production to the service sector to make “massive profits” I started feeling out of place. This entry was posted in Opinion and tagged biochemistry, biology, Cambridge, Cancer, exams, library, revision by Victoria Wang. Bookmark the permalink.